Thus Es Et includes dialect writing from authors, playwrights, poets, storytellers, mimics, performers, and recorders from the late 18th century to the present day. The impressive list of contributors emphasises the importance of Cornish dialect and the need to preserve it for future generations. And as well as being a literary anthology, Thus Es Et is a form of social history, describing the lives of Cornishmen at work and at play. The wide variety of genres and subject matter will delight the reader and the extensive glossary will be an important reference source. It was said of the great Victorian novelist Chalres Lee that “there is nothing in his dialect to estrange the English reader”. 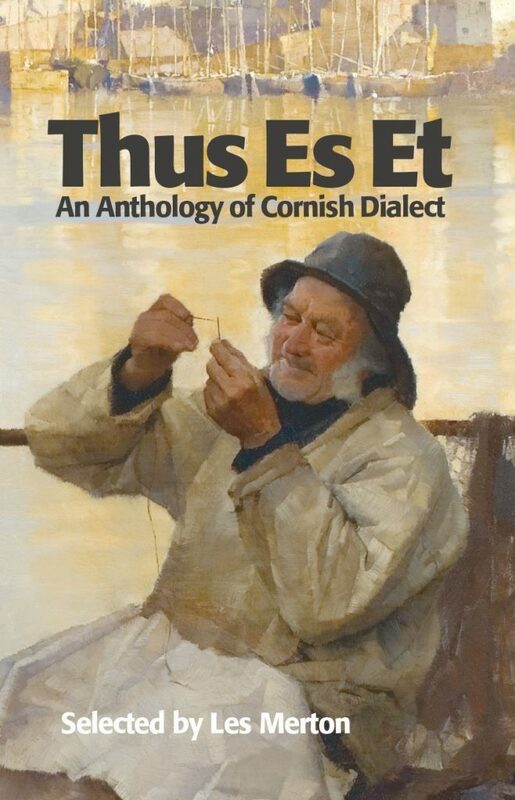 Unfortuntely even native speakers who pick up an excellent new anthology of Cornish dialect might have trouble making sense of the title, which is a pity because its contents are both of a high quality and immensely welciome. Thus Es Et has been compiled by Les Merton, himself a dialect writer, and brings together authors, playwrights, poets, storytellers, mimics, performers and recorders from the late 18th century to the present day. Clearly a major undertaking, there are contributions from some 50 scribes, spanning such diverse figures as Billy Bray, Robert Hunt, Lilla Miller and Miichael Tangye. Sometimes referred to, rather pretentiously by academics as “Cornu-English” in an attempt to pop dialect into a neat little box for study, the idiosyncaratic speech of ordinary working folk is perhaps the language that most accurately reflects the Cornish psyche. Much emphasis has been placed of Kernewek in recent years as it was forcibly wrestled from academic exclusivity and put back into the mouths of the people. But during this period of change, dialect was unfortunately forced to take a back seat. Thus Es Et may help put it back where it belongs. Dialect is a slippery fellow. Numerous writers downthe years have tried, with varying degrees of success, to capture the spoken words and phrases on paper. In the hands of skilled practitioners like Charles Lee, Ken Phillipps and Joy Stevenson, dialect flows as naturally as if the reader were hearing it straight from the speaker’s mouth. Others, meanwhile, can deliver it orally with authenticity and great wit, but struggle with the written version. Then there is the tricky matter of spelling. If the Cornish language movement suffered strife and internal warfare over an agreed orthography, just image the battle if anyone was foolish enough to suggest that dialect was in need of a “standard written form”. Fortunately this is unlikely to be proposed. There have been dire wrnings of dialect’s demise in recentt years. But despite these fears, it hasn’t gone away yet, clinging on tenaciously in the speech of rural people in particular. Waned, yes. Altered, certainly. But nevertheless still on the lips of many. The East Cornwall double-negative, for instance, is still imibed like mother’s milk in some areas, as is the use of the seemingly unnecessary extra “to” when expressing direction or position. Les Merton is a long-time champion of dialect and, as such, is well qualified to put together such an anthology. A writer and performer of stories and poems, his own books include Miss Laity’s Tay Room and Oall Rite Me Ansum. The recipient of numerous literary awards, Les was made a Bard of Gorsedh Kernow in 2004 in recognition of his contribution to literature. “When we talk of ‘speakers of dialect’ we imply that they employ a provincial method of speech to which the person who has been educated to use the language of books is unaccustomed,” says Les. He adds that while the words “dialect” and “accent” are sometimes regarded as interchangeable, theiir definiition is quite distinct: accent being concerned with vocabulary, special phrases and different forms of grammar. Stressing that while some of the contributors to Thus Es Et write in standard English and use dialect only for direct speech, Les says others employ a phonteic form of spelling throughout. Included among the more than 80 individual stories and poems are some fine contributions from early exponents such as William Sandys and George Henwood. Arranged chronologically, they move through Silas Hocking, Arthur Quiller-Couch, Jack Jolly, Mrs Rosewarne and Ken Phillipps to living exponents like Joy Stevenson, Liz AHarman, Mary Quick and Les Merton himself. However, despite the large number of authors included in Thus Es Et, there are many notable omissions that the collection inevitably begs the question: Es Thus Et? Where is Charles Lee, for instance? Or, for that matter, Anne Treneer, J Henry Harris, Mark Guy Parce and N R Phillips? Wemust hope that Les Merton is simply leaving the way open for another collection in the near future. And with such a lovely cover as Frank Bramley’s painting Eyes And No Eyes, it is to be hoped that non-dialect speakers are not put off by the book’s odd title. Tim Saunders has gathered together more than a hundred poems from a variety of sources – magazines, books and manuscripts – to give us the first ever survey of poetry in the Cornish language from 1850 until 1980. This anthology brings together for the first time in one collection the riches of Anglo-Cornish poetry from the Renaissance to the the twentieth century.